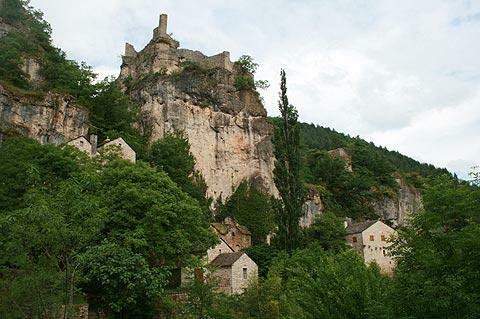 Castelbouc is a very small village located in the Gorges du Tarn to the east of Sainte-Enimie. 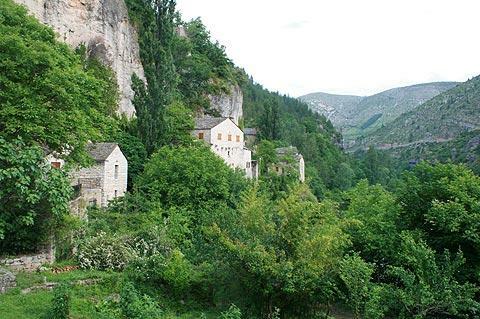 Deep in the gorges on the edge of the Tarn river, it really is a 'picture postcard perfect' village. Descending a small road from the main road through the gorges, you cross a small low bridge to reach Castelbouc - which is about 20 houses strung out through the village (some are out of view behind the others). There are also the ruins of a castle on the hill above the village. Rather ominously there is a sign at the bridge saying it was sometimes submerged under the water - you would be very brave to cross in these conditions, since the bridge has almost no edges and would be completely invisible! There is an alternative, longer route that reaches the village and avoids the bridge. 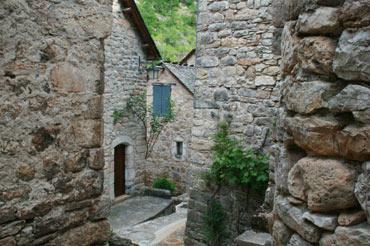 As the village is so small it doesn't take long to explore Castelbouc. 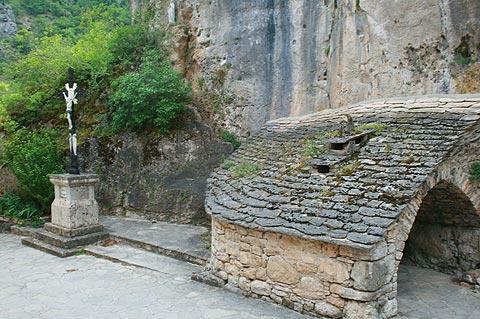 In the village itself there is a small 'centre' with a church, a cross, and the original village bread oven. Each of the houses is very pretty, and I could easily have taken photos of each and every one of them, but then you would have nothing new to see when you visited! There is also a touching tribute to those from the commune that lost their lives in the First World War, including faded photos of each of the soldiers. Note: after visiting the village and returning to the main road (or if you don't have time to stay long, or the bridge is flooded...) there is a marked viewpoint on the road above that looks down into the valley and Castelbouc, and is well worth stopping to see - although you will need to squeeze into a gap between the coaches of tourists who have also stopped! 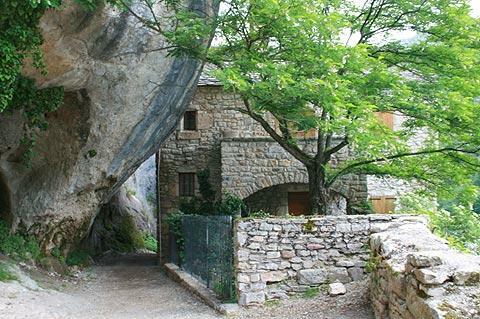 Situated at the eastern end of the Gorges du Tarn there is a great deal of dramatic scenery to enjoy near Castelbouc. Simply drive along the road through the gorges! 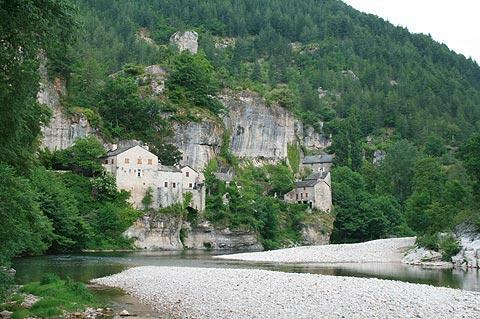 Our favourite villages in the Gorges include Sainte-Enimie and Saint-Chely-du-Tarn. 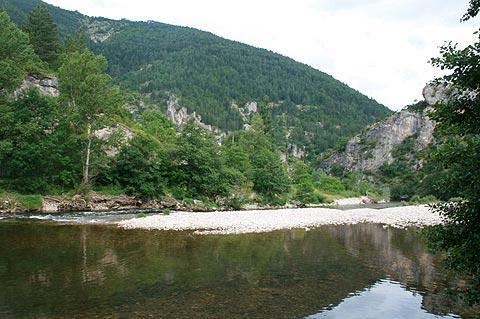 To the east of Castelbouc, outside the gorges and towards the Cevennes National Parc the scenery is also very picturesque - start your exploring at Florac.